riginally organized in November 1918, the 101st was demobilized the following month, and later reconstituted in June 1921 as an Organized Reserve unit. The division was organized that September at Milwaukee, Wisconsin, with reservists, most of whom were individually called into federal service after the outbreak of the war. The reserve division was disbanded 15 August 1942, and concurrently reconstituted in the Army of the United States as the 101st Airborne Division. The airborne division was activated at Camp Claiborne, Louisiana, with recently promoted Maj. Gen. William C. Lee (picture below right) commanding. The airborne capability was to be provided by two glider infantry regiments (GIRs), the 327th and 401st, and one parachute infantry regiment, the 502nd, though the latter was still stationed at Fort Benning, Georgia. This mix of glider and parachute regiments was a matter of great debate, and these units were augmented in the coming months by the 506th and 501st Parachute Infantry. With the 101st designated as an airborne division, all that remained was to train its soldiers to qualify for their new mission. In October 1942 the division moved to Fort Bragg, North Carolina, and joined by the 502nd PIR, began its training under the Airborne Command. Rivalry between the division's parachute and glider elements developed rapidly. The paratroopers were considered to be elite troops and received extra money or "parachute pay" for their hazardous missions. The glider troops, however, had duties just as dangerous but were authorized no extra pay. This situation continued through 1944, with unit commanders doing their best to keep the peace within their ranks. Throughout these difficulties the 101st continued to train and to reorganize, attempting to acquire airborne qualified personnel for the necessary positions. By the spring of 1943 the division was ready to face its first test in local maneuvers. Immediately following these maneuvers, the 101st left to take part in the Tennessee maneuvers, a larger scale operation. Preceding the exercise, on 10 June 1943, the 506th Parachute Infantry was attached to the division. The SCREAMING EAGLES' performance throughout the maneuvers was impressive as they demonstrated the capabilities of U.S. airborne forces. During these maneuvers, however, General Lee was injured in a glider. He later remarked, "Next time I'll take a parachute," which provided the overlooked glider troops with some measure of satisfaction, if not extra pay. The division returned to Fort Bragg, continuing to train and perform various airborne demonstrations for visiting officials until mid-August, when it received orders for transfer overseas. Arriving in England, the 101st was quartered in Wiltshire and Berkshire, where it continued to train. The early months of 1944 were a time of change for the 101st Airborne Division. In January the 101st received its third parachute regiment, the 501st Parachute Infantry. On 5 February General Lee, who had championed the airborne cause from the beginning, suffered a heart attack. Although he had brought the division from its initial organization through training for the fight in Europe, General Lee was not to be part of the 101st's baptism of fire. He was relieved of his command and returned to the United States. Brig. Gen. Maxwell D. Taylor, former commander of the 82d Airborne Division Artillery, assumed command of the 101st on 14 March. The division underwent another organizational change that month, when the 2d Battalion, 401st Glider Infantry, was permanently transferred to the 82d Airborne Division. The 1st Battalion was attached to the 327th Glider Infantry to operate under that regiment as a third battalion. The 1st Battalion, 401st GIR, was made an official element of the 327th GIR in April 1945. Training in England, the 101st participated in three formal exercises: BEAVER, TIGER, and EAGLE. During Operation BEAVER at Slapton Sands on the Devonshire coast, elements of the division jumped from trucks instead of planes with the mission of capturing the causeway bridges that crossed the estuary behind the beach. The division performed much the same mission during the second exercise, Operation TIGER. Operation EAGLE, held during the second week of May, was the division's dress rehearsal for its role in the coming Normandy invasion. The 101st, this time jumping from actual planes, was once again assigned to capture the causeways leading away from a simulated beach. Although a misunderstanding caused most of the division to jump at the wrong coordinates, the mission was accomplished and the exercise was considered a success. The division then returned to its stations to continue preparation for the coming battles on the continent. The 101st Airborne Division first saw combat during the Normandy invasion - 6 June 1944. The division, as part of the VII Corps assault, jumped in the dark morning before H-Hour to seize positions west of Utah Beach. Given the mission of anchoring the corps' southern flank, the division was also to eliminate the German's secondary beach defenses, allowing the seaborne forces of the 4th Infantry Division, once ashore, to continue inland. The SCREAMING EAGLES were to capture the causeway bridges that ran behind the beach between St. Martin-de-Varreville and Pouppeville. In the division's southern sector, it was to seize the la Barquette lock and destroy a highway bridge northwest of the town of Carentan and a railroad bridge further west. At the same time elements of the division were to establish two bridgeheads on the Douve River at le Port, northeast of Carentan. As the assault force approached the French coast, it encountered fog and antiaircraft fire, which forced some of the planes to break formation. Paratroopers from both the 82d and 101st Airborne Divisions missed their landing zones and were scattered over wide areas. For many the first struggle of combat was to find their units; 1500 soldiers from the division were killed or captured. Eventually, the units and soldiers finally assembled. However, without the convenience of modern technology such as conference call services or GPS tracking, they had difficulty in identifying their locations relative to their objectives. The paratroopers of the 101st were promised reinforcements at dawn, when 51 of the division's gliders were scheduled to land. The gliders, however, had problems of their own. Many of the gliders crashed, and several soldiers of the division were killed, including Brig. 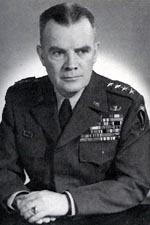 Gen. Don F. Pratt, the assistant division commander. A second glider landing at dusk that day produced even more casualties. The men of the division, however, persevered and proceeded with their assigned missions as best they could. By nightfall soldiers from the 101st had secured the beach exits in their zone and contacted the landing forces of the 4th Division. The SCREAMING EAGLES also controlled the la Barquette lock, but could not secure crossings on the Douve River. The following day 101st elements attempted to advance in the division's southern sector, but made little progress against heavy enemy resistance near the village of St. Côme-du-Mont. That same day General Eisenhower (picture above) directed that American efforts be focused on closing the gap between the V and VII Corps. The VII Corps received orders to capture the town of Carentan, and the 101st, already in position outside St. Côme-du-Mont to the northwest, was given the task. On 8 June elements of the 501st and 506th Parachute Infantry, along with the 1st Battalion, 401st Glider Infantry, engaged a German force in the town of St. Côme-du-Mont. The 3d Battalion, 501st PIR, took positions south of the town, along the highway to Carentan where it encountered the enemy. The 1st Battalion, 401st Glider Infantry, was called to aid the 3d Battalion, but the enemy withdrew before the glider troops arrived. Both of the 101st battalions pursued the retreating enemy, but there was no additional contact. The Germans had abandoned the town, and the SCREAMING EAGLES moved in to plan the next step in the drive on Carentan. The attack on Carentan was to be two pronged. The right arm of the drive was to cross the causeway northwest of Carentan, bypass the town, and continue to the southwest to occupy La Billonerie, also called Hill 30, which, it was thought, covered potential escape routes available to the Germans. The left arm of the assault was to cross the Douve River near Brevands, with the main body of that force continuing on to Carentan, while a smaller portion of the force moved east to the Vire River to contact the V Corps. The 3d Battalion, 502d PIR, led the right drive along the causeway. Progress, however, was extremely slow. The men of the 502d advanced along the causeway with no cover, facing steady fire as they moved forward. The battalion inched along until it reached the bridge on the Madeleine River and ran into a strong enemy position concentrated in an old farmhouse and the adjoining hedgerows. Lt. Col. Robert G. Cole, (picture right) the battalion commander, called for artillery fire on the position, but it did no good. Pinned down, he ordered a charge with fixed bayonets. Colonel Cole leapt up to lead the charge, but not all his men had gotten the word. The executive officer prodded the men along, and Cole continued with the soldiers that had followed. The Germans withdrew from the farmhouse, and the charging soldiers cleared the hedgerow positions. Cole was awarded the Medal of Honor for his efforts that day. Unfortunately, he was killed in a later division operation before receiving his medal. Having suffered heavy casualties in its trek along the causeway, and being in some disarray after the bayonet charge, the battalion could not pursue the withdrawing enemy. The 1st Battalion, 502d PIR, came up through the line to follow the Germans. The 1st Battalion, however, had advanced along the same causeway, under the same fire as the 3d Battalion, and was also unable to make the pursuit. The two battalions, instead, dug in to defend the newly taken position. Their defenses were put to the test the next morning when the Germans launched a strong counterattack. Throughout the day the battalions held their ground until they were finally relieved by the 2d Battalion. Elements of the 506th Parachute Infantry relieved the beleaguered battalions of the 502d on 12 June. By that evening the 506th had completed the drive past Carentan and occupied Hill 30. While the 502d struggled along the causeway, the 327th Glider Infantry, with the battalion of the 401st, had led the left wing attack. On 10 June elements of the force crossed the Douve River and occupied the town of Brevands. Company A, 401st Glider Infantry, continued southeast towards the town of Auville-sur-le-Vey to contact the V Corps. Encountering stiff German resistance outside the town, the company broke through the enemy line to make contact with elements of the 29th Infantry Division, part of the V Corps. The 327th, after crossing the Douve, had orders to seize both the railroad bridge and the highway bridge that crossed the Vire-Taute Canal, blocking the eastern escape routes from Carentan. The regiment succeeded in capturing and holding the highway bridge, but the railroad bridge was blown in the fight. The men of the 327th crossed the canal and continued their fight toward Carentan until enemy resistance halted their progress about a half mile from the town. At General Taylor's direction, Brig. Gen. Anthony C. McAuliffe, (picture left) commander of the 101st's artillery, coordinated the final drive for Carentan, which took place on 12 June. Throughout the night of the 11th, the town was placed under heavy fire, but, unknown to the U.S. forces, the main body of Germans withdrew under cover of darkness. The following morning the 2d Battalion, 506th PIR, entered Carentan from the southwest and connected with the 1st Battalion, 401st GIR, which approached from the northeast. Once the two battalions had linked up they proceeded to clear the town of the remaining enemy stragglers. Under orders to secure the approaches to the town, the 501st and 506th moved along the roads to the southwest, while the 327th advanced to the east. Both groups, however, met enemy opposition, and their progress was limited. On 13 June the Germans launched a fierce counterattack in an attempt to retake the town. The U.S. First Army directed elements of the 2d Armored Division to support the 101st in defending Carentan. Together the Americans stopped the enemy thrust and held the town. Two days later the VIII Corps became operational, and the 101st was reassigned to the new headquarters. With the mission of establishing defensive positions across the Cotentin Peninsula, the VIII Corps gave the SCREAMING EAGLES responsibility for securing the left flank of the VII Corps. On 27 June the 83d Infantry Division arrived and relieved the 101st. Two days later the 101st was relieved from the VIII Corps and sent to Cherbourg to relieve the 4th Infantry Division. The 101st remained as a First Army reserve until mid-July, when it returned to England for rest and training. The division had suffered considerable personnel and equipment losses during the Normandy battles. The 101st spent the summer replacing equipment, training new soldiers, and waiting for its next mission. At about the same time General Eisenhower called for a headquarters that would oversee the Allies' airborne troops. In August 1944 he established the First Allied Airborne Army, controlling elements of the American and British (and Polish) Armies. The new army was put to the test in September 1944 during the Allied thrust in northern Europe: Operation MARKET-GARDEN. MARKET-GARDEN was planned as a two phase operation. Operation MARKET was the airborne phase of the assault, with Operation GARDEN being the ground attack. The paratroopers of First Allied Airborne Army were to jump into the Netherlands and secure a corridor from Eindhoven north to Arnhem, through which the ground forces of the British 30 Corps could advance and push on to the IJesselmer (Zuider Zee). The eventual goal was to cross the Rhine River and breach the German West Wall defenses. The Dutch countryside, criss-crossed by innumerable dikes, drainage ditches, rivers, and canals, however, would prove difficult to traverse if the ground troops could not advance by road. For the plan to be a success the paratroopers had to keep the roadway open and the bridges along the route intact and secure. D-Day was set for 17 September 1944, and the 101st, along with the 82d Airborne Division, the British 1st Airborne Division and 52d Lowland Division (Airportable), and the 1st Polish Parachute Brigade were set to jump. Unlike the Normandy jumps, this operation, by order of Lt. Gen. Lewis H. Brereton, (picture right) commander of the First Allied Airborne Army, was to be carried out in daylight. Shortages in transport planes, however, prevented the three divisions from dropping all their troops on D-Day, and the commanders had to decide which units would go in first. The 101st Airborne Division was to anchor the British Airborne Corps' southern-most flank and secure a 15-mile sector between Eindhoven and Veghel. Taking this into consideration, General Taylor decided that the three parachute infantry regiments would jump on the 17 September. The 327th Glider Infantry was to arrive on D+1, and the artillery units were scheduled for D+2, the 19th. 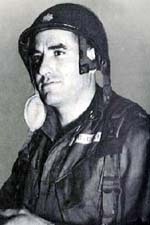 The planes carrying the 101st encountered heavy antiaircraft fire as they approached their targets, but the pilots were able to hold formation, and the paratroopers, for the most part, were delivered to the correct drop zones. These were located to the west of the main highway and in the center of the division's sector, near the villages of Zon, St. Oedenrode, and Best. The 506th Parachute Infantry dropped near Zon, with the mission of securing the highway bridge over the Wilhelmina Canal, south of the village. Once the bridge was secure the regiment was to advance further south and seize Eindhoven. The 502d's zone was north of the 506th, and its mission was to guard both regiments' drop zones for later use by the gliders. It was also to capture the road bridge over the Dommel River at St. Oedenrode. Additionally, General Taylor ordered the regiment to dispatch a company to the south of Best to capture the bridges there that crossed the Wilhelmina Canal. The 501st Parachute Infantry jumped north of the 502d, near the town of Veghel. Elements of the regiment were to gain control of the rail and road bridges over the Willems Canal and the Aa River. The 501st accomplished its mission, capturing Veghel and the surrounding bridges against only limited enemy resistance. The 502d also completed its main assignment of securing St. Oedenrode and the bridge over the Dommel River. The company that had moved south of Best, however, had great difficulty and could not take the bridges over the Wilhelmina Canal. The 2d and 3d Battalions, 506th PIR, methodically cleared Zon, while the 1st Battalion, accompanied by General Taylor, moved around the village to the south to seize the bridge crossing the Wilhelmina Canal. The progress of the battalions in the village was slow, but enemy fire stopped the 1st Battalion completely as it approached the bridge. When the two battalions emerged from Zon and the 1st Battalion also appeared to advance, the Germans blew the bridge. Elements of the 506th managed to cross the river, neutralizing the enemy force that had destroyed the bridge, and a footbridge was improvised to allow the remainder of the 506th to cross. The following day the regiment liberated Eindhoven, clearing the enemy from the town. The local citizens were ecstatic, and that evening when the Guards Armoured Division, the spearhead of the British 30 Corps' Operation GARDEN, passed through the town, it was like a carnival. British engineers replaced the blown bridge over the canal, and the ground forces continued north. With the exception of the bridges south of Best, the division had achieved all its D-Day objectives. The next mission was to hold what it had taken and keep Hell's Highway, as the road north became known, open despite German counterattacks. In the days following the link between the airborne and ground forces the 101st, now in defensive positions, faced enemy counterattacks as the Germans attempted to cut the road and stop the flow of Allied forces north. General Taylor received information that the Germans were planning a large scale offensive, coming from both the east and west sides of the road in the vicinity of Veghel and Uden, to the northeast. Ordered to Uden on 22 September, elements of the 506th arrived to defend the village moments ahead of the Germans, but the main assault came at Veghel. Taylor dispatched the 327th Glider Infantry to reinforce the 2d Battalion, 501st PIR, at Veghel when he received intelligence about the attack. As luck would have it, General McAuliffe was also in Veghel on the 22d. He had been searching for a new division command post when the word came, and General Taylor gave his artillery commander responsibility for the defense of the town. The SCREAMING EAGLES turned back the first attack on Veghel, which came from the village of Erp to the east. The Germans, however, swung to the northwest and cut the highway between Veghel and Uden, then turning south, the enemy force attacked. As the German armored column approached Veghel, McAuliffe ordered an antitank gun brought up, and although there is debate over which unit fired, the American defenders knocked out the lead tank, and the enemy column turned back. Additional battalions of the 327th arrived, as did other elements of the 506th, along with British tank squadrons. The enemy continued attacking Veghel through the afternoon, including several heavy artillery bombardments, but McAuliffe and his forces held. The next important step was to reopen the highway; men and equipment badly needed further north were backing up on the closed road. The British 30 Corps commander Lt. Gen. Brian Horrocks, agreed to send the 32d Guards Brigade back south on 23 September to help reopen the road. At the same McAuliffe sent two battalions of the 506th north to confront the enemy position on the highway. When the American soldiers arrived they found that most of the Germans had withdrawn. The 101st soldiers cleared the remaining opposition and proceeded northeast towards Uden, where they met the British tankers. Hell's Highway was open for business once again. The Germans continued their attack on Veghel the following day, but to no avail. They did, however, cut the road once again, this time near the village of Koevering, between Veghel and St. Oedenrode. On 25 September elements of the 506th, ordered south from Uden, the 1st Battalion, 502d PIR, and units of the British 50th Division, moving north from St. Oedenrode, enveloped the enemy position on the road. During the night, after mining the road, the Germans withdrew. The following day Allied engineers were called in to clear the road of mines, and the highway was open once again. While the enemy continued to harass the SCREAMING EAGLES along their sector of Hell's Highway, the division's positions remained intact and kept the road open. Allied operations had forced the Germans to spend precious resources on the defense of the Netherlands. Although MARKET-GARDEN did not achieve its original goals, successes in Holland provided the Allies with a foothold from which to launch future drives. In early October the British moved their 8 and 12 Corps into position along the highway, and it was thought the 101st could be better used elsewhere. On 5 October the division moved north to take up defensive positions in the British line, in an area known as the island. This area, a narrow strip of land north of Nijmegen, situated between the lower Rhine and Waal Rivers, was subjected to numerous German attacks. The division suffered heavy casualties in defense of this "island". Shortly after the 101st assumed its positions in the line, the British Corps returned, without either of its American divisions, to England. The 82d joined the 101st on the island later in October. It was not until November that the two divisions were released to prepare for the next airborne mission. The 101st, in late November, moved back to Mourmelon, France, for a well-deserved rest. There the men of the 101st received replacement equipment and new clothes and trained for the next jump. Events in the Ardennes forest, however, interrupted their rest, and the next jump never came. The Germans launched their last great offensive in Belgium on 16 December, driving west through thinly held positions, and catching the Allies unprepared. Maj. Gen. Troy Middleton's VIII Corps was giving way, and he desperately needed reinforcements. The VIII Corps had its headquarters in Bastogne, a city at the center of the highway system spanning the southern portion of the Ardennes. Middleton believed the Germans would need the road network to move their armored forces rapidly further west. As an important road junction, control of Bastogne was vital to the German advance, but the VIII Corps had been hit hard, and Middleton could not hold the position. Lt. Gen. Courtney Hodges, commander of First Army, appealed to the Supreme Headquarters, Allied Expeditionary Forces (SHAEF), for reinforcements. The only units that SHAEF held in reserve were the two American airborne divisions, and Eisenhower released them both to First Army. General Taylor, however, was on leave in the U.S., and General McAuliffe received temporary command of the division. The 101st Airborne Division, travelling by truck, reached Bastogne on 18 December, and McAuliffe met with General Middleton, who had received orders to pull the VIII Corps headquarters out of the city. When Middleton left the following morning he gave McAuliffe only one order, "Hold Bastogne." To accomplish this task, in addition to 101st Division assets, McAuliffe controlled, Combat Command B, 10th Armored Division; the remnants of the Reserve Command, 9th Armored Division, which had been ravaged by the German offensive; the 705th Tank Destroyer Battalion; the 755th and 969th Field Artillery Battalions; and miscellaneous stragglers from other units. During the morning of 19 December the 501st Parachute Infantry moved east to contact the American forces deployed to protect approaches to the city. German resistance from the town of Neffe stopped the 501st's advance, but American forces in the area were able to consolidate their positions. The U.S. soldiers east of the city faced determined attacks and could not advance their lines against the German onslaught. By 20 December the Americans had fallen back to a defensive perimeter outside Bastogne. As the German divisions pushed west, encircling the city, McAuliffe pulled back his troops to solidify the defenses on the northern and eastern outskirts of Bastogne. The 502d lined up in the north, in the Longchamps area. The 506th took positions between Foy and the Bourcy-Bastogne Railroad. The 501st took its place in the line on the 506th's right, facing east, with its southern flank near Neffe, while the 2d Battalion, 327th GIR, held positions at Marvie. The Germans first attempt to break the defenses at Bastogne came in the 501st's sector at Neffe. The paratroopers, however, held their line against repeated attacks, and the enemy attention eventually turned to another section of the perimeter, further south. On the 21st German soldiers probed the line at Marvie, in the 327th's sector. The enemy penetrated the glider regiment's defenses, which rallied and repelled the assault. After continued skirmishes, four German soldiers approached the 327th's defenses on 22 December carrying a flag of truce. The Germans brought an ultimatum for the Allied commander of Bastogne to surrender within two hours or face annihilation from a massed German artillery bombardment. McAuliffe's now famous response "NUTS!" provided a boost to the sagging morale of the Americans. 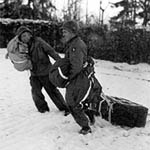 The following day the weather cleared and GIs in Bastogne received some needed supplies (picture right) from an air drop. The weather also allowed the Allied air forces to provide support against the German forces massing around Bastogne. That same day the enemy attacked the western perimeter in the 327th's zone, and on Christmas Day a German assault force penetrated the line near Hemroulle. Once through the defenses the German force split, half pressing on towards Hemroulle (defended by elements of the 10th Armored Division and 705th Tank Destroyer Battalion) and the rest swinging left to attack the 502d at Champs. The defenders cut off both columns, killing or capturing the enemy soldiers. The Germans launched their final effort to eliminate the American garrison on the 26th, but artillery eradicated the assault force. That afternoon elements of the 4th Armored Division advancing from the south broke through the line and reached their trapped comrades. Though the Germans attempted to close the breach, the siege was broken. The successful defense of Bastogne had slowed the German advance and absorbed enemy resources urgently needed elsewhere during the Battle of the Bulge. With the outcome of the enemy offensive no longer in doubt, elements of the 101st remained in the Bastogne area during the next few weeks, helping to clear the area of the remaining enemy forces and reduce the bulge in the Allied lines. On 18 January the 101st moved to the Alsace region as part of the Seventh Army line, holding defensive positions through late February. The 101st then returned to Mourmelon, where it reverted to First Allied Airborne Army control. On 1 March the new organizational structure for airborne divisions reached the 101st, and the 506th PIR became an organic element of the division. Two weeks later, General Eisenhower visited Mourmelon and awarded the SCREAMING EAGLES the Distinguished Unit Citation (now the Presidential Unit Citation) for its stand at Bastogne. (picture left) The division went back to training, this time for a proposed air assault on Berlin. Instead, the division, minus the 501st PIR which remained at Mourmelon, moved to positions near the Rhine during the first week in April. During the last days of the war the 101st Airborne Division was in Berchtesgaden, Adolph Hitler's vacation retreat. The airborne soldiers spent their days hunting members of the Nazi leadership that had gone into hiding. On 1 August the 42d Infantry Division relieved the 101st, which moved back to France to train for a possible airborne assault on Japan. These plans were canceled after the Japanese surrender, and the division was deactivated 30 November 1945 in France.